Here are the fruits of yesterday's labour! Dying the yarn was lots of fun, although my hands didn't get stained like I thought. I started by weighing out skeins in amounts to make one outfit - 20g for the sport weight, and 25g for the worsted weight. I then soaked it for a couple hours before dying. I have food colouring in yellow, red, and blue (concentrated paste form, not the liquid drop stuff you get in the grocery store) and found citric acid at the drug store. I was kind of surprised to actually find it, albeit in a small bottle, although they have even stranger stuff on the same shelf. Anyway, I mixed up the colours I wanted in microwaveable plastic tubs. It took about 1/4 tsp of dye and 1/2 tsp of citric acid per 3 cups water, although I was just guessing at the amount of citric acid and probably used more than I needed. I had to dissolve the dye in a couple tbsp of water first, which made it difficult to see what colour it actually was. I painted a bit on some paper to get a better idea, and wrote down how much of each colour I used. Then I added a skein of yarn, and microwaved it until the yarn had absorbed all the dye. I did this 3 min at a time, stirring in between. The lighter colours only took about 6 min, the darker ones more like 15 min. Then I placed the tub in a sink of cold water to cool the yarn, before rinsing it and hanging it to dry. I'm really pleased with the colours I got. My first try turned out a little more green than I intended (this is the turquoise skein) because I forgot to compensate for the yarn being natural cream instead of bleached white. You can't tell from the photo, but the yarn turned out slightly heathered, which I really like. I have no idea why this happened, but I think it will give the toys' clothes a more rustic, old-fashioned look, which is totally appropriate for where they will be sold. This isn't really meant as a tutorial on dying yarn, since there are plenty out there written by people much more experienced than me. This is more like a way to encourage you to try it yourself, just because it's fun, doesn't cost much, and involves yarn! Posted by Barbara Prime at 10:30 a.m.
That's awesome! I didn't know we can use food coloring! How did you get the paste? Dose the color last? 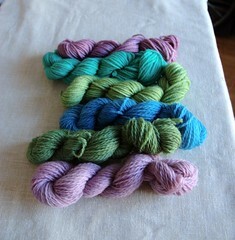 I heart dyeing yarn!!! I will certainly try this sooner or later! It may not be a tutorial, but you have been descriptive enough so that pretty much anyone can try it! Good work! January 20, 2008 at 11:29 a.m. I had been thinking about food colouring for a while, because that's what's in kool-aid. You do need the citric acid for it to work, though. None of the dye came out when I rinsed the yarn, so I'm pretty sure the colour is permanent. You can find the paste food colouring at pastry-making supply shops (don't know what they would be called in French). What I have came from a shop called Papillon in Pointe Claire. January 21, 2008 at 11:06 a.m.